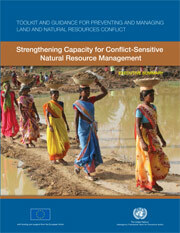 Conflict-sensitive natural resource management systems are an important tool for preventing violence. A natural resource management system is conflict-sensitive if the power to make decisions about vital resources can be contested by different stakeholders without violence. This, in turn, requires a government that is capable, accountable, transparent and responsive to the wishes and needs of its population. It also requires a civil society that is ready and able to engage with government to manage resources in a sustainable, profitable and non-violent manner. External actors, can help build the capacity of conflict-affected and fragile societies to understand, manage, mediate and respond to natural resource conflicts without violence, but the process must be led from within.